The Easter bunny sure needs some big eggs and chocolates to fill this Easter basket at Lakeview Park in Lorain, Ohio! 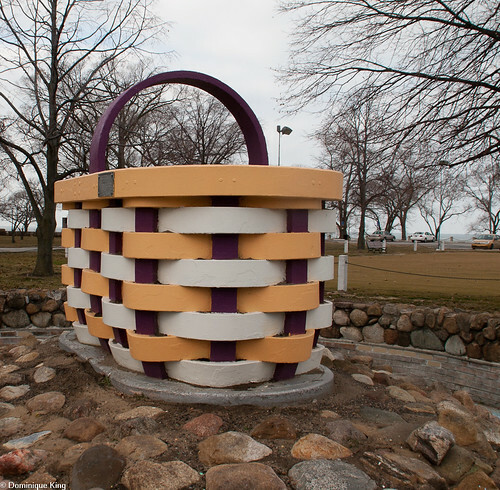 This concrete basket, measuring just over 7 feet tall and a little more than 10 feet wide, draws scores of visitors to the park on the shore of Lake Erie each spring to take photos of their families in their Easter finery. In fact, there is a Flickr group devoted to such shots dating back to 1941, when park employee David Shukait first erected his colorful creation. 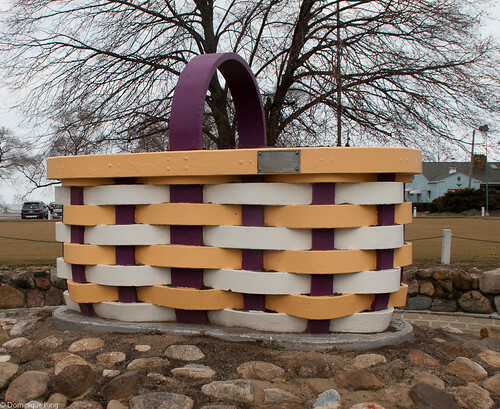 Lorain's park supervisor originally envisioned a large flower basket as a grand entrance to the park and asked Shukait, the park mechanic, to make it happen. Shukait took six months to figure out how to come up with a workable design that involved creating a wooden form as a mold and filling his molds with concrete reinforced by steel rods. Shukait patented his design. 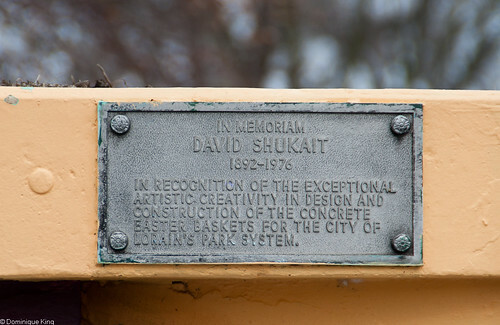 Shukait then set about assembling his curved, concrete pieces in the park system's maintenance garage during the winter with the help of National Youth Administration workers. The basket was a public works project, and the National Youth Administration was a Depression-era New Deal program envisioned by Eleanor Roosevelt to employ young people. Workers installed the large basket near the park's entrance in spring of 1941 with a plan to plant flowers in it when the weather got warmer. It was so close to Easter, however, that someone got the bright idea of putting colorful Easter eggs in the basket, hatching what became a traditional photo op for generations of area families. The Easter bunny is often on hand during the week leading up to Easter to pose with families at Lakeview Park and at a similar basket Shukait created for Lorain's Oakwood Park. Park employees repaint the basket every year or so, and the color scheme in these photos, taken in January of 2011, echoes the peach-white-purple colors of the early 1970s. The Lorain basket sits along the Lake Erie Coastal Ohio Trail. Check out my story Lake Erie Coastal Ohio Trail Highlights for other attractions on this scenic drive along Ohio's northern coast. Check out Lorain County Metro Parks: The First 50 Years by Gary S. Gerrone to learn more about Lorain-area parks. How funny! I like the peach, white, and purple colors. Do they change the colors everytime they repaint? How neat! What a creative way to do that! Very neat! I wonder if I would be the only mom who would have kids that would try to scale the sides and get inside? Cool site and great history! Jen-They do change the color scheme from time to time. I'm not sure if they re-paint it every single year, but I saw several different color schemes in the Flickr group I linked to with Easter Basket family pix over the years. Amy-The man who created the basket originally thought it couldn't be done, but he came up with something that seems to look quite nice. Wanderluster-I do love how taking pictures with this sculpture became (and remains) a holiday tradition among families in the area. Adorable! I love interesting photo-ops with my daughter...this would definitely be a fun one.